Hello Friends! 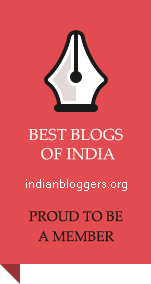 The good news is that “Pretty Pink Pebbles” has been featured as one of “The Top 15 Art Blogs of India” by Baggout! A huge thanks to Baggout for the honour and the kind words! There is beauty everywhere you look. From the lush green grass on the ground to the wandering clouds in the sky, you can see beautiful images everywhere. When you are in your darkest gloomiest mood, even a little piece of beauty can brighten up your day. This blog provides this happiness with cheerful and joyous art that will refresh your mind and soul. This is a land where no tension and worries enter and only glee and delight have a free pass. Here you will find stories, photographs, designs and other things that will bright up your day and cheer up your mood. That is the excerpt from the link itself, that captures the essence of PrettyPinkPebbles pretty well! I thank each one of you for being the good force around me, that keeps me going!!! How about spreading some arty cheer! Like us on Facebook today and have a beautiful day! This entry was posted in Uncategorized and tagged Art, Blogging, Gratitude, India, Photography. Bookmark the permalink.